"I won't be early" were Paul's last words when I confirmed I would meet him at Sty Head, with Kath Brierley, for the second leg of his 65@65. 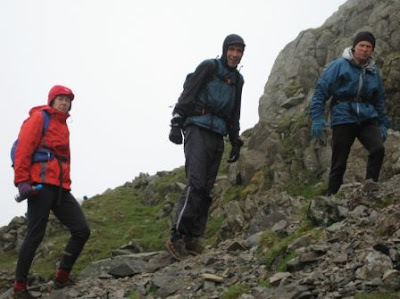 Postponed from last summer this is a continuous traverse of the highest 65 summits in the Lakes. Leaving Seathwaite a little earlier than I planned I was confident of having time for bite at the Ambulance Box before setting off up Great Gable and so it was something of a surprise when approaching Sty Head to see Edwin pointing towards Gable. "They are not coming down that way, I am sure" I thought and then the awful realisation began - they were going up, having already left Sty Head. Quick confirmation with Edwin that I had everything I needed and then it was like the Borrowdale race but with a rucksack! Before long I reached them to learn we were an hour up on the schedule - just as well Paul was taking it steady. The ignominy was shared as they had left before Kath arrived and so Rae, who had been with Paul since the start at 02:00, carried on as far as Pillar Rock. The rest of the day was spent taking it steady to reach Buttermere 2 hours ahead of schedule. Kath left us in Ennerdale and Paul continued on through the night with his daughter Ros and on through the following day with others to complete the traverse in 46 hours 17 minutes. A huge achievement and, I am sure like everyone who helped over the weekend, I feel fortunate to have been involved. Kath and I waited on the col while Paul, Rae and Rob went up Pillar Rock and although dry it wasn't terribly warm, hence all the clothes. Recovery run with Pauline on Sunday and then twice a day, including a track session on Tuesday, to reach this week's targets by close on Wednesday to ensure two days rest before the weekend. Saturday is John Swift's "Joss Naylor". I am meeting him at Dunmail with Rachel Metcalf for her first outing as a support runner (I am hoping she enjoys it and that she will then help on my 55 in June) and staying with John to Greendale Bridge and navigating from about Rossett Pike. Pauline will join us at Sty Head for the last leg. This will be the first time I have formally navigated a leg and so the 'weather paranoia' has been (is still) extreme this week. Right now it looks dry until lunchtime, light cloud but strong winds on the summits - but it is only a forecast. The weather for the rest of the weekend appears changeable but if doesn't deteriorate we will go to the Howgills on Monday to avoid the crowds and revisit some grassy slopes we haven't seen for a while. The rest of the week will be working towards another 70+ and 10,000+ with half an eye on Duddon on the 31st. I shouldn't taper for it and just treat it as another long training session. This week is a bit different, as was last week, when being rested for Saturday is important.